Yealink designs its audio conferencing solutions to suit a range of different meeting environments. Unify a clear-and-easy conferencing communication experience for both in-room and remote participants. The CP960 targets mid-to-large-sized meetings while the CP920 covers small-to-mid-sized meetings. Pure and powerful sound quality, enterprise-grade and performance-oriented, Yealink conference phones deliver best-in-class HD audio quality. Adapts to multiple room environments and provides a full sound experience. The CP960 supports star connection with up to 3 models of CP960, working together to meet super large meeting broadcast and voice pickup requirements. When a person is not speaking, Noise Proof automatically mutes the mic(s) until the sound of a human voice is detected. The CP960 puts smooth and easy control at your fingertips. For users who prefer a traditional key system, the CP920 offers a familiar touchable keypad for less stress and more comfort. Offering up to five-party conferencing. The CP960 creates a virtual meeting room user interface -- that mimics the sense of physical conferencing for fast and easy conference control. Displays the current speaker’s icon to make conferencing easier than ever. 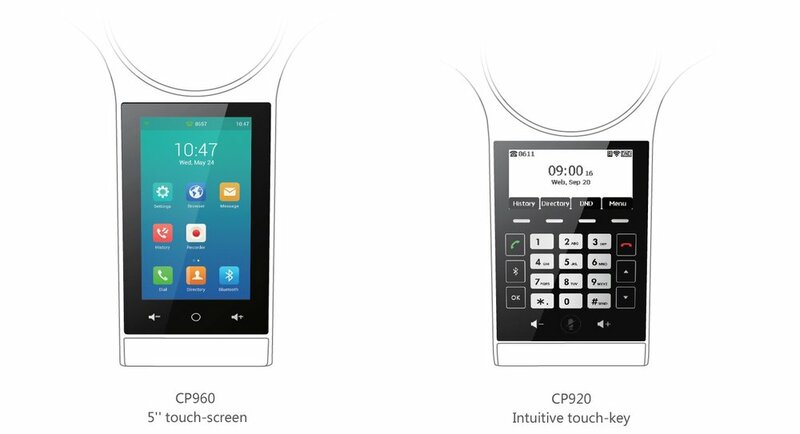 The CP960 and CP920 enable the Hybrid UC Meeting for extraordinary convenience. Join or create a conference by simply merging the calls.